We open on the desert, a girl with a (husky) but for the sake of argument let’s say that it’s a wolf. It turns out that she’s been with the wolf pack for 3 years, before that a human she called Papa, whom she rescued, had captured her and taught her how to be human. She turns around, the men sneer at her saying, how can you steal from someone under our emblem (Jiu Ye’s Emblem is the wolf) She asks for Salt and some clothes. One of the men tells her to stop lying, they have many ways of torturing the truth out of her. Jiu Ye looks at her and gives her the stuff, with the parting words, “Mistress, you should be among your own kind.” She thanks him and runs off. He pulls off his face covering (gasp at his perfection) they smile at each other and she leaves. The Girl sees another caravan a while later. This time, this caravan is under attack and she calls in her wolf (adorable puppies) at which the attackers run away in fear. They try to thank her with jade earings, she tells them she has no need for those. She waves it away and tells them that she will lead them to safety. They stop off and rest, the girl we learn is named “Xin Yue” and the Man gives her some oinment. She huffs at him that she doesn’t need it, he teases fine, he’ll use it all himself. She says that from his callous, he’s a fighter, he doesn’t need ointment. He smiled and hands it to her, asking if she wants to try it. He offers her wine, saying that it’s from the best eatery called Yi Ping Jiu. She drinks it and remembers her father, who had reminisced to her about the place, since he was from Jian An. They part ways and when Xin Yue turns around to look back at the guy, he smiles in joy. Xin Yue says goodbye to brother wolf and travels to Jian An, fulfilling her father’s wish that she go be with the humans. She had received money from the man she rescued and used it all on her first day, not really knowing the value of the money she got from the man she rescued. In hunger and homeless she bunks down with a crowd of beggars. A kind old man offers her food, telling her that it’s all going to alright, there’s nothing she can’t handle. The next day, Xin Yue goes to find odd jobs but gets refused. She bumps into a well dressed lady who asks where she’s staying, if Xin Yue has any money, if she has any family in the city. The well dressed lady smiled at XIn Yue and gives her the job of sweeping the garden. Xin Yue works hard all day and Hong Gu offers her a bunch of meat buns. Xin Yue eats a lot happily, she’s been hungry for way too long. Xin Yue falls asleep after eating a bunch of meat buns and Hong Gu observes that it took her long enough, it was suppose to be instant but she ate so many. Xin Yue wakes up in a room with another girl and learns the truth, that she’s been kidnapped by Hong Gu and is now going to be a dancing girl at a dance house Lu Yu Fang, a very famous dance house. It’s because she’s very pretty, while it’s not a prostitution house, the other girl worries that no one else see it that way. Unless they become very famous, no one wants to become a dance girl. Hong Gu tells her to come and sit, she tells Xin Yue, “People who panic when they are drowning don’t realize that it’s their panic that’s killing them. If they stop struggling, they’ll float, anyone can do it. Often those struggling don’t realise how close they are to the shore.” She advises Xin Yue to do well, this is just another way to get on her feet. Xin Yu learns how to dance at the dance house and likes it immensely. But people have been looking for her. At a celebration in the dance house, all the new girls get drunk, XIn Yue observes that Hong Gu’s actually a good person and spends money on the girls. A bunch of men come in and Hong Gu is extremely respectful towards them, it turns out that these men are from the one who owns the land the Dance House is built on. They ask if Hong Gu knows about a girl who came three months ago. They ask that Xin Yue come with them. Once everyone leaves, Hong Gu kneels to Xing Yue and explains that she had done a grave wrong. The person who owns the land on which the dance houseis built had specifically ordered that no girl be kidnapped against her will. She begs XIng Yu and Xin Yue smiles saying that Hong Gu has not done her wrong. They go to the Landlord’s large Shi residence, Wu Ye (the one who came to get Xing Yue) asks the Shi Housekeeper if this was the girl the Master was looking for, The housekeeper smiles saying that most of the other girls had come in and left very fast, they’ll know soon enough. He smiles and says that she looks well, she replies that she’s always looked well, expect now she has the right clothes, like a horse has the right armor. He smiles at her. It turns out that one of the beggars had taken the old beggar, his grandfather to the doctor. Because they didn’t have money, they took Xing Yue’s clothes to sell. The owner had traveled with Jiu Ye and showed it to Jiu Ye, that’s how he knew. They talk about Hong Gu and Xing Yue says that Hong Gu has known she’s done wrong, Jiu Ye says that this will be under WU Ye’s purview, she smiles knowing that he won’t punish her harshly. They go inside and Xing Yu’s hungry. He asks what she wants to eat, as she’s begun to eat the decorative food for new years. She says she wants big chunks of meat, the kind that she’s use to, not Hong Gu’s dishes where the meat’s thinly sliced. He orders her lots of food and fast. She asks why his name is Jiu Ye which means Ninth Master. He says that it’s for luck. His real name is Mo Xun. She asks why his name doesn’t start with Shi, he’s not the master of Shi? He smiles and says that just because her name is Xin Yue, doesn’t mean she’s draped with the moon. When the food comes she impatiently pushes the veggies aside and goes straight for the chicken legs. He admonishes her to eat the vegetables, only vegetables will make a girl look pretty. She looks at him skeptically and eats one. Once she finishes, she looks at him. 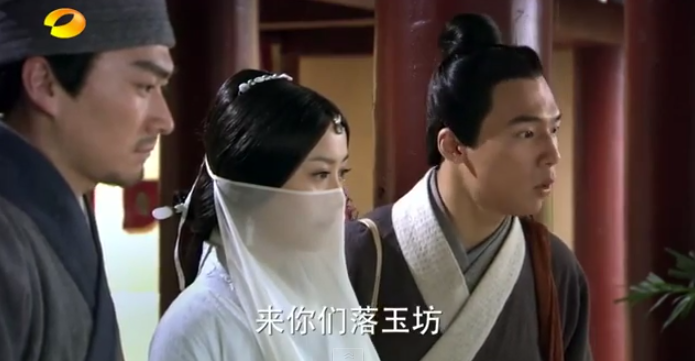 She says to him that now Jiu Ye’s brought her here, she likely can’t go back. Since he’s a upstanding man, he’s definitely going to take responsibility for her. He looks at her and she back tracks, she tells him that she can look after accounts or do work. He says that he’ll ask around, and she can think about what she wants to do. She says that she’ll be like a servant. He cuts her off, saying that he doesn’t want her to be a servant, because she’s his guest. A friend that he’s reunited with. Meanwhile, the man she rescued, Wei Wu Ji has been going to Yi Ping Ju to look for her often. He asks and hears that she’s been around, he worries about her, thinking that he should’ve given her more money. Xin Yue is happily living at Jiu Ye’s place, she write “Nine” or Jiu in the snow happily. She meets two of Jiu Ye’s people and they recognize her. They recognize her too and wonder how Jiu Ye, who only lives by himself, allows a girl to live there as well. While with Jiu Ye, they snark about guests that are too forward and hosts that are too polite to say no. Xin Yue excuses herself and goes outside, wondering how Hong Gu was doing. She goes to look for Hong Gu, and goes to visit. She and Hong Gu are traveling in a carriage when a handsome man passes, the soldiers parting the way for him. Xin Yue recognizes him as the man she rescued in the desert. Hong Gu tells her that its Wei Wu Ji, an eligible bachelor – his uncle is a general, his aunt the Empress. She can’t believe that she’s finally seen him. Hong Gu explains how the current Empress, who use to be a dancing girl at the Eldest Princess’s house became the empress while Wei Wu Ji’s uncle was a lowly soldier who became a great general. Xin Yue gets the idea that if she aligns with the royal houses, she could help out Jiu Ye. That night she comes home, observing quietly that Jiu Ye sits there waiting for her, silently reading like her dad use to do, she thinks that this is what contentment must feel like. She enters and Jiu Ye asks how her day was, she tell him and asks why the current Shi enterprises is not as powerful as before. Jiu Ye smiles and says that he doesn’t have the energy. She asks if she could learn about the Dance House buisness and he promises to set it up for her. He returns the clothes that had been sold. Hong Gu welcomes back Xin Yue as the owner, she is courteous at first but Xin Ye makes her lower her formalities. Hong Gu is actually relieved that someone else can shoulder the dance house responsibilities. The other Dance House is more popular and Hong Gu has no Idea how to make hers become popular again. Xin Yue’s first order of business is to release a reluctant girl (from the first episode, who had been sold against her will) from her contract. While Hong Gu disapproves, Xin Yue assures Hong Gu that the money to “buy” the girl out of her contract will come out of Xin Yue’s pay, she’s going into debt before actually making any money. Hong Gu says that the fastest she’s seen the girl move since she got into the house. Hong Gu leers at Xin Yue saying that now she’s released the most pretty girl, Xin Yue has to pay with her body. She drags Xin Yue Off. It turns out that she made Xin Yue get earrings. Xin Yue moans about how painful they are, staying in her room and mourning how ridiculous she looks with the red string and little white balls. A knock on the door and she yells “Enter!” at which Jiu Ye comes in. Xin Yue panics and scrambles for cover. He asks gently what’s wrong and she reluctantly shows him. He examines her ears gently, he tells her not to move. He asks if she’s not tired sitting like this, she’s actually crouching like a puppy. He motions for her to come sit by him to put medicine on her ears. He tells her that when he was young, his mom gave him earings too. She turns her head to look at him and his lips brush her forehead. He smiles and tells her the story of how his mom had heard that by taking care of him as a girl, he would get less sick. He tells her that his were multi colored. xin Yue things to herself that no one outside of her dad has taken care of her like this, and she silently tells her dad that she’s very happy. She gathers leaves to write on them, so that she doesn’t forget all her happiness. That night she and Jiu Ye play a duet, she sees his loneliness and resolves to use everything to chase away his sadness and loneliness. At Xin Yue’s dance house, it’s a roaring trade, Xin Yue had put on Hua Yue Nong, which becomes the most popular play in the capital. What it’s really about Xin Yue and Hong Gu are asked to go see an audition, where a man named Qin Yun Ji a musician who wows them both with his skill. A few days later he brings his sister, who’s walk is even beautiful. They had refused the other popular dance house as employment because his sister had heard of Hua Yue Nong, wanted to come to Xin Yue’s dance house. Xin Yue realized that the girl is dangerous, she’s too smart and too calculating. The girl – Qin Xiang, had realized the ulterior motive behind the song Hua Yue Nong. Xin Yue’s instincts tells her not to keep the girl, so refuses to keep them. Hong Gu doesn’t understand, but Xin Yue made the final decision. Ding lin the girl Xin Yue had released wants to come back. She complains that Xin Yue knew that she couldn’t do anything once Ding Lin had gotten out. Xin Yue harps back that she can’t go blaming her troubles on everyone else. Hong Gu comes in to act as the good guy and sends Ding Lin to to rest. Once gone, Xin Yue asks Hong Gu how does it feel to play the good guy for once? That night, Jiu Ye comes to visit Xin Yue to check on her ears, he says that they’ve healed nicely, she doesn’t need the medicine anymore. She says “No! No!” She smiles and says that she’s scared that they might get infected again, can he put it on for her one more time? He smiles as she goes to run and get the medicine. She stares at the reflection of him carefully putting the medicine on her ears. She tells him how the business is going. He reassured her that he’s not worried about giving her the business. She smiles at him and he’s a little unbalanced at her smile. Outside, Shi Feng, a servant asks about Hua Yue Nong, the play that Xin Yue’s put on. 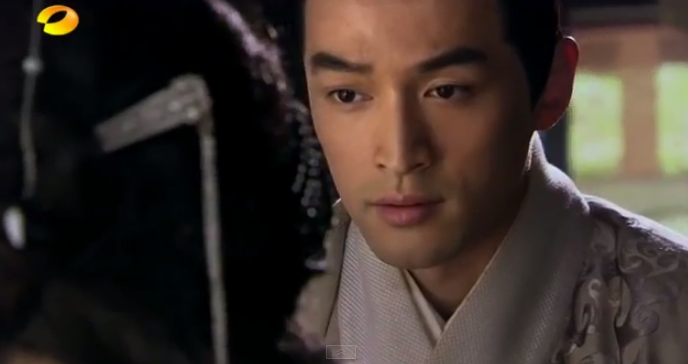 He warns her that Jiu Ye doesn’t want to meddle in politics. But it’s because Hua Yue Nong is actually about the Princess and the General’s love story, it would attract the Princess’s attention. The next day Xin Yue hears that Hong Gu has allowed the 2 Qin brothers and sister Qin Xiang into her dance out, because Hong Gu saw the other dance house bullying them for refusing to work for the dance house. Hong Gu got angry and took them in. Xin Yue knew that this was a ploy set up by Xin Qiang but has to accept Hong Gu’s choice. At first I was confused as to the name changes. Only Jiu Ye’s name was the same while Huo Qu Bing and Jin Yu’s names were pretty much changed. Also – it seems like they changed the name to Pocahontas. Chang An became Jian An, while I’m not even quite sure what dynasty we’re in. This is definitely not the Wei Zi Fu empress we’re talking about. I’m a huge fan of the book and don’t mind tweaks, but clearly this was to please SARFT. (Because now, nothing is historically accurate, while some names are derived from the history books.) As for the story – I’ll stick by it to see how it progresses. I liked Jin Yu and Li Yan were friends first and Jin Yu was above all, a business woman in the novel. She was shrewd, so having the drama Xin Yue refuse Qin Xiang (Jin Yu and Li Yan, damn name changes) work – that seems entirely counterintuitive of Xin Yue’s goals. I blame SARFT. Hu Ge lights up the screen with Liu Shi Shi whenever these two are together. Or maybe it’s because I’ve waited so long for this pairing or because I’ve waited so long for Hu Ge, either way, I’m recapping only because of Jiu Ye. I would have loved to see HG play Huo Qu Bing, but him as Jiu Ye, okay, yes, I get it. He’s exactly who I pictured Jiu Ye to be, and without a doubt can carry the melancholy air like a cloak. Also, being distracted by Eddie Peng’s Chin (Jay Leno would be proud), I haven’t seen enough to fall in love with Huo Qu Bing –sorry i mean Wei Wu Ji. Having read the book, I can say that I think everyone who sees this drama should read the book first. The drama doesn’t do the story justice just yet. You can find the english version of the novel at Koala’s Playground go down to Da Mo Yao book translation. I highly, highly recommend it. Yep! I’m planning to do per summary recaps on a daily basis (lord help me). I really liked your recaps as well! Thanks! How do you like the drama so far? So far it’s good enough to keep me captivated, although I can’t say I’m impressed by all these name changes and location changes. I think I’m still in the hype of it finally airing, so I just need time to digest the drama for a bit to critique it just yet. Me too! I’m watching for Hu Ge and because it actually has some really great songs. I’m in the process of translating one right now. I’d love to see what you think, I think I got most of the interpretation right, but I haven’t read any ancient Chinese poems in a while. Oooo are you translating 五月天阿信 – 為你平定的天下? Nope, I haven’t gotten to that one yet! I’m doing 白头吟. The lyrics are just so beautiful. I love the other one too I didn’t now it’s 五月天, now I really want to do that one as well haha. oh 白头吟’s poem has been translated by decembi http://onesecondspring.blogspot.sg/2014/05/talk-15-poem-behind-da-mo-yao-legend-of.html if you need any references. yep! It’s the same 🙂 I might as well before I turn in. I’m actually glad that this drama’s only doing 2 ep per day otherwise I might never get to sleep 🙂 Good night! no, he actually comes into the pic in ep 3! Is this the cut or uncut version? I’m watching the English subbed version on YouTube and episode 2 is totally different from your recap. I also got a bit confused by all the name changes..with the real names, the nicknames..and the fake names. T_T” Will Mo Xun primarily go by ‘Jiu Ye’ throughout the drama?